Laser transfer technology has lots of profitable possibilities. In addition to creating soft colorful transfers on light and dark apparel, laser printers can be used to make super-soft foil transfers. Metallic heat transfers can also be made with a vinyl cutter and ‘T-shirt vinyl’ but the laser transfer foil process does it with self-weeding papers that make production much more efficient. 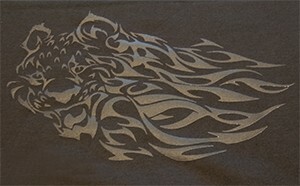 Our EnduraTRANS HF HotFoil T-shirt transfers have ‘wowed’ crowds at trade shows and Open House events. People love the high gloss metallic look, soft hand, and ease of application. If you’re in the garment decoration business, you owe it to yourself–and your bling-hungry customers– to find out more about this exciting application. All laser transfer solutions require special self-weeding papers to transfer toner to the substrate. In all other laser transfer applications, the toner supplies the final image. Not so with hotfoil. The process is similar to applying foil with a screen printer and adhesive plastisol ink. 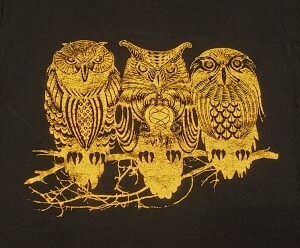 In this case, the toner takes the place of adhesive ink, bonding the foil to the fabric. Here’s how it works. Step One: Design a flat, spot color image for the under-base. This should be a silhouette with solid fills. If possible, choose a color that matches that of the shirt or the foil. If you have any pinholes in the applied foil, this keeps the color of the garment from peeking through. Choose a black under-base for a black shirt, red for a red shirt, etc. If you’re applying the foil to a white shirt, choose a color that’s as close as possible to the color of the foil instead. And, as with all other transfer processes, you’ll need to flip or mirror the image before printing. Print on EnduraTRANS FHC transfer paper using the User Type 1 media type setting for your printer. Fig 1: After removing the FHC paper, you will have a base layer of toner to which the foil will adhere. Step Three: Lay the EnduraTRANS HF foil on the toner shiny or colored side up. Cover with a Teflon sheet and increase the pressure to heavy. Press for 20 seconds at the same temperature. Allow it to cool to room temperature, then slowly peel the foil. It’s a self-weeding foil, so as you peel it away, the foil color adheres to the toner, creating a beautiful and soft metallic appliqué. (Fig 3). 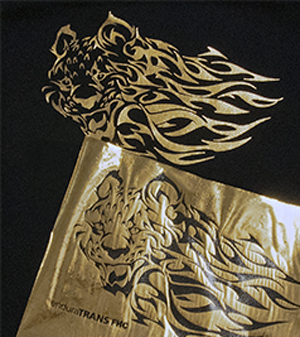 The foil transfer process is ideal for applying intricate metallic graphics with fine detail. Compare the time spent applying a transfer to the time spent cutting and weeding metallic T-shirt vinyl. If you’re only making one shirt, there might not be much of a difference. But what if you get an order for 15 hoodies for a team of majorettes? You do not want to cut and weed those. The EnduraTRANS HF HotFoil solution is the most efficient way to fulfill these kinds of orders. There are a couple of drawbacks. All metallic foil garments should be handled with extra care. Foil transfers can be machine washed, but not machine dried. Tumble drying bleaches the color from the foil, so line drying is recommended. Tell your customers to treat it as a delicate garment. And as noted above, this is a spot color process, so your designs are limited to single colors. We currently stock foils in Silver, Gold, Red, Royal Blue, and Purple. The finished garment looks like a million bucks. But the cost is actually quite low compared to other metallic accent options. The EnduraTRANS HF foil comes in 12” x 200’ rolls for only $30.00 per roll. An 8.5” x 11” image costs 9¢ in foil. The total cost for toner, paper and foil is about $1.00 – $1.25 per shirt. Applied to a black cotton shirt, you have a total cost of about $2.50 and five minutes for a custom garment you can easily sell for $15.00 – $25.00. The old adage “all that glitters is not gold” does not apply here. 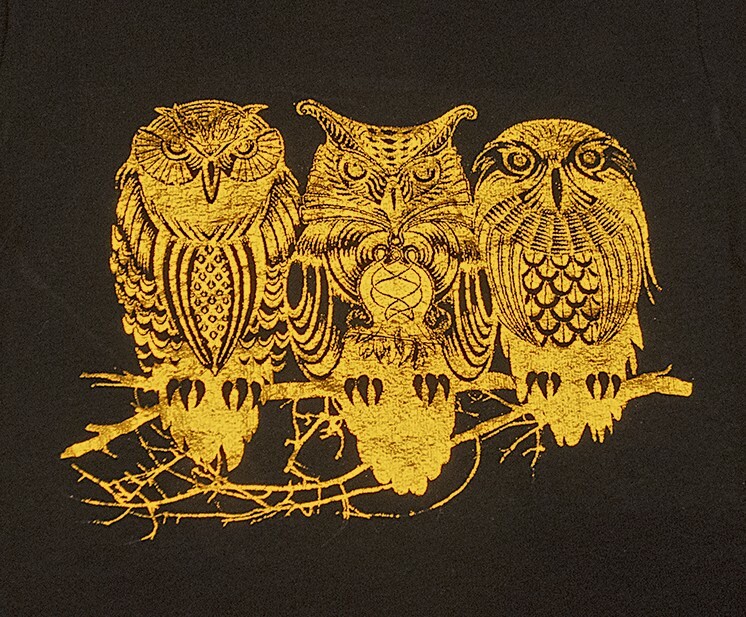 Making glittering T-shirts can put lots of gold in your pocket. Laser Foil transfers are a great way to take advantage of new trends and technologies in garment decoration. The finished product has a surprisingly soft hand, can be produced more easily than screen printing, and more efficiently than heat transfer film. Your customers get a highly fashionable custom garment and you get a highly profitable addition to your product line. It’s a ‘killer app’ for your GO UNO, OKI C831-TS, iColor 500, or OKI WT laser printer. If you don’t have one of these marvelous devices, you can rectify that situation right now, right here.